The final standings of the ACP Tour 2017 will be published on January 20th. - to check if all your results are correctly calculated. 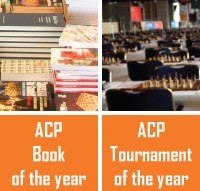 To remind you, any ACP Premium member can submit his/her result in a tournament which was not included in the ACP Tour, if he/she obtained the TPR of 2700/2500. If you have any doubt or think that something is missing or should be corrected please contact ACP Tour Director Pavel Tregubov at gmtregubov@hotmail.com.